A compelling Sixook series that will keep you turning pages. Set against the backdrop of early Galveston, history comes alive as you read this exciting tale. This historical fiction is packed with dark suspense, romance and tragedy. 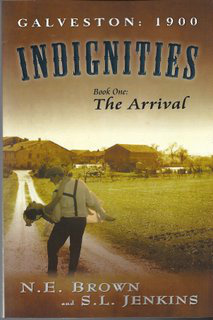 "Galveston: 1900: Indignities, Book One: The Arrival, by N.E. Brown, and S. L. Jenkins, is an exalted, heart-stirring work of fiction. It starts as Anne struggles to reconcile a tragic past and an uncertain future in Galveston, Texas. She has lost her husband, son, and daughter. She decides it is time to leave Sandgate, England with her oldest daughter, Catherine. Anne attempts to start a new job at the Grand Opera house -- with disastrous consequences. The scheming begins after David Brooks gets her the job, and decides he has a ruse of his own. He is absolutely loathsome, and will stop at nothing to get what he wants. However, Anne and Catherine are finding a sweet new happiness together, in their new life. The story develops into a tale of lasting friendship, pure love, betrayal, unending suspense, and tragedy.